I said that I would tell you how William West Durant affected the characteristics of the Adirondack guideboat. Then I realized that another larger-than-life character also had an impact on guideboat design. His name was William Henry Harrison Murray. Neither Durant or Murray had a direct influence on what became the quintessental Adirondack guideboat, but they surely had an influence. 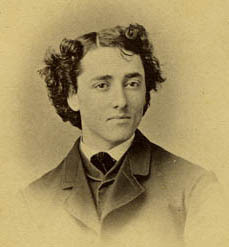 Adirondack Murray as a young man. Durant drew the absurdly rich to the Adirondacks by building his Great Camps. Murray was a preacher in Boston who was drawn to camp in the Adirondacks every summer. He became convinced that everyone, regardless of their social or economic status, should experience the wonders of the wilderness. He felt that through such a journey one was brought closer to his Maker. In 1869 Murray published Adventures in the Wilderness, a book rich with tales of his experiences while being guided down Long Lake and into Raquette Lake. His writing is clear and direct. It neither talks over the reader’s head or talks down to him. Humor, suspense, and mystery are sprinkled throughout the book. But the book carries through on his wish that the common man have the spiritual experience of being immersed in the natural world. The first part of his book reads like a Fodors of the Adirondack wilderness. It tells how to get there, what clothes to wear, who are the best guides, the best hunting and fishing gear, and so on. The railroads, anticipating a rush to the Adirondacks, began giving the book away. 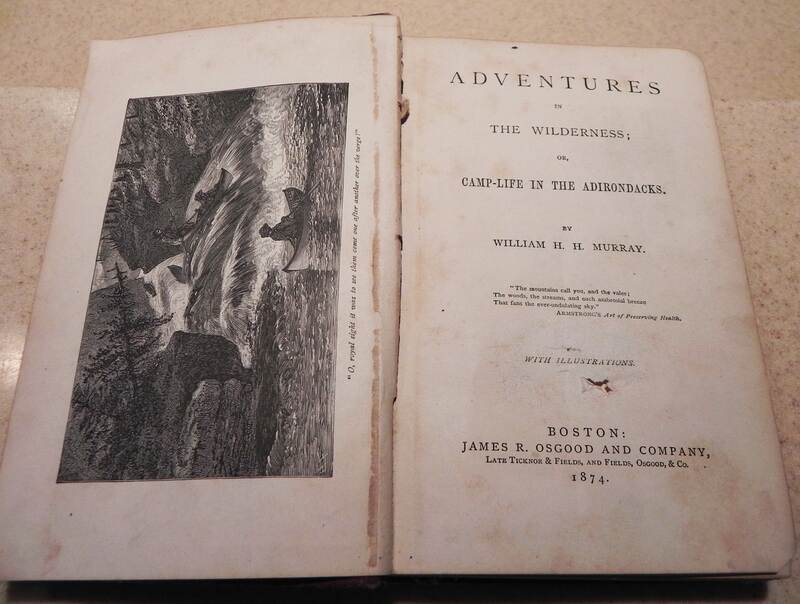 Adirondack Murray’s book Adventures in the Wilderness, published in 1869. The public’s response to the book was overwhelming. Tourists, sportsmen, and all manner of humanity flocked to the Adirondack wilderness during the summer of 1869. You can imagine the chaos when several thousand people descended on a wilderness where there was little of everything; food, lodging, and guides. To make matters worse the summer of 1869 was miserable, rainy and chilly. Those who heeded Murray’s call to follow him became known as “Murray’s Fools”. So how did these two very imposing figures, W. W. Durant and William H. H. Murray have an effect on the Adirondack guideboat? Before they came on the scene guideboats were a work boat, created by each guide over the winter months. A guide might sometimes make more than one boat to sell to another guide but the demand for these boats was not great enough to make a living building them. Guides built their boats to meet their own needs. First of all they had to be lightweight and rugged. They kept things simple. Their boats were painted and they used planks for seats. The owners of vast wealth brought to the Adirondacks by Durant and the stable tourist trade encouraged by Murray changed that. The Great Camps owners became enamored by the sleek design of these boats and decided just one or two wouldn’t do. The Pryuns of Camp Santanoni had a boat house on Lake Newcomb, home of their Great Camp, a boat house on near-by Moose Pond, and one at their gatehouse in Newcomb. They had at least eight guideboats scattered about these locations, all built by Caleb Chase. Hotels hired guides by the day to row their clientele about their lakes. My friend Tom Bissell remembers that builder Wallace Emerson would tow a fleet of guideboats each spring up Long Lake to the long gone Sagamore Hotel there. Private clubs, like the Adirondack League Club, took many of the boats. The increased demand for guideboats meant that shops devoted to building these handsome, but not easily built, craft began to spring up and prosper. 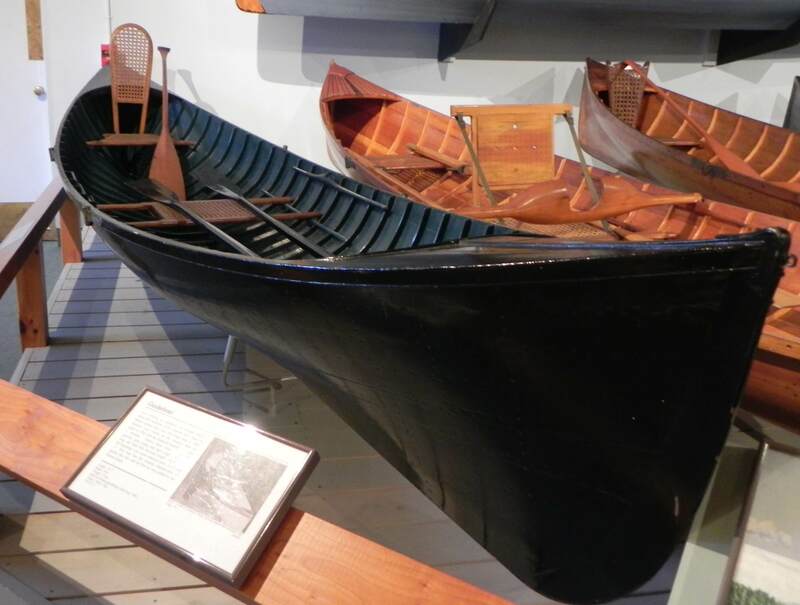 Towards the end of the 1800’s there were 72 guideboat builders in the Adirondacks. With the increase in number of builders came competition. Though easier to plank, lapstrake construction was replaced on these boats by smooth skinned planking. Simple plank seats gave way to caned ones. The middle seat got a hinged back rest that would fold down when not in use. Now can you see any self respecting guide using a back rest? The ultimate in catering to the changes that tourism brought was a grate-like affair that conformed to the inside of the hull. It was meant to protect the thin skinned hull from ladies in high heeled boots. Decks were not immune to being gussied up. Fancy woods were used and each builder had his own idea for a unique design. And that bare hole in the bow deck used to hold the lantern for jacking deer; now adorned with a fancy brass feed thru. 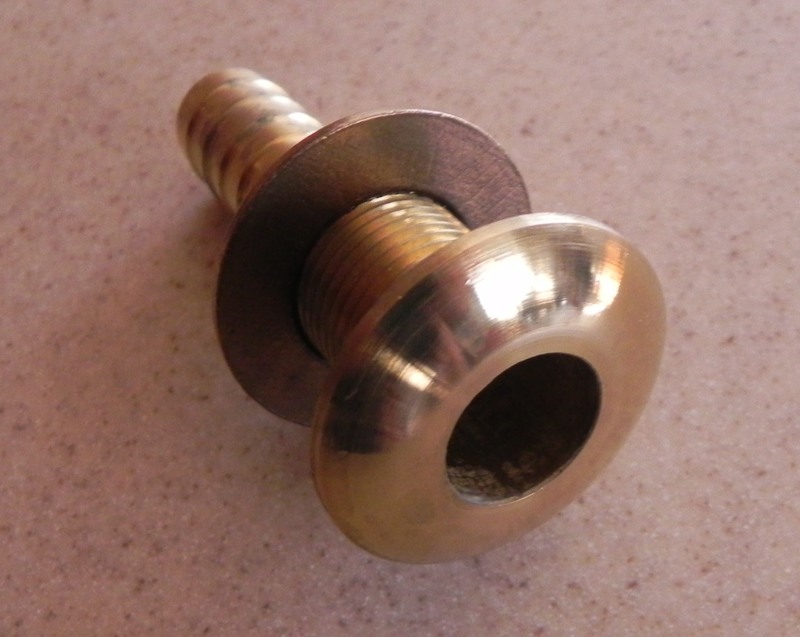 Brass feed thru that goes into the bow deck to hold the lantern for jacking deer. Varnish replaced paint as the preferred finish. Varnish showed off the light honey color of the pine planking. It also showed the vast array of copper tacks used to seal the hull and the lines of brass screws used to secure planks to ribs. Applying varnish to get a mirror-like, run-free finish is tricky business and far more time consuming than brushing on a few coats of paint. Shops like the Grants, Chase, Parson Brothers, Warren Cole, and others hired perhaps six or more skilled carpenters and soon gained a reputation for excellence. 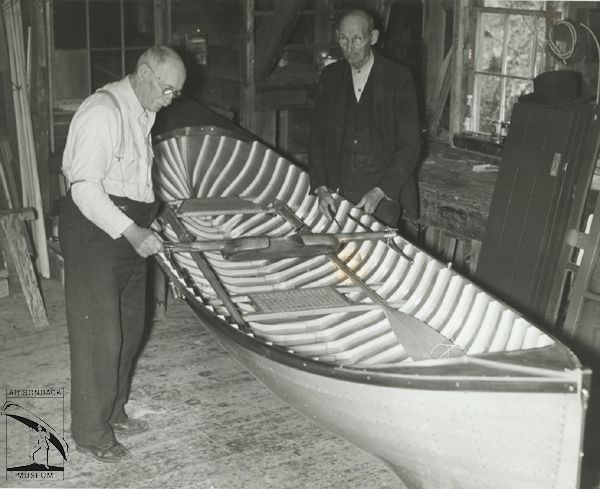 The Grants, father Dwight and son Lewis, built 358 boats, all from their shop in Boonville, NY. The Parson Brothers, Ben and Ira, inherited their boat building business from their father. Here they are in their later years. The Parson Brothers, Ben and Ira, with one of their guideboats. Here is one of their boats, a Raider, at 14 feet 3 inches. A Raider built by the Parson Brothers. I found fascinating a view of their shop taken around the turn of the century. 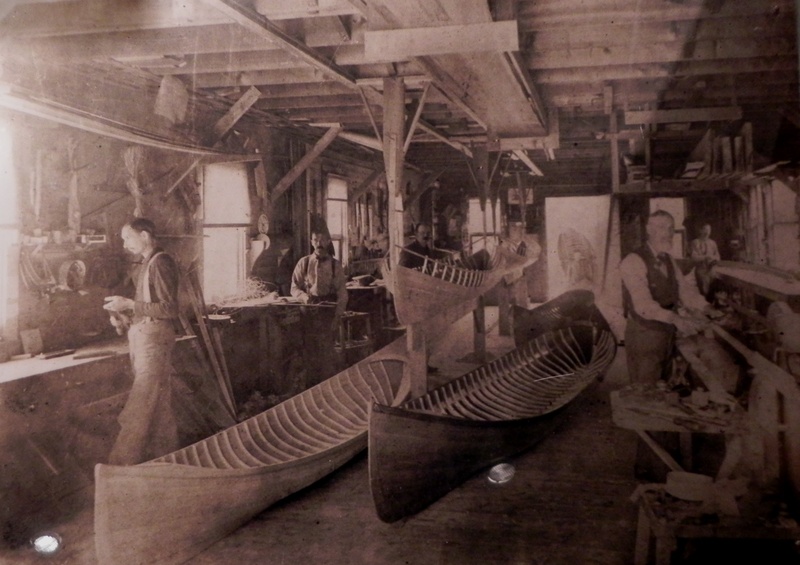 The Parson Brother boat shop, about 1900. There are actually six men in this photo. You probably missed the fellow outside the rear doorway. He is carrying a guideboat on his shoulders in true Adirondack guide fashion using a yoke.